Though I have lived in Columbus for the entire 21st century, I spent my late teens and early 20s in Pocatello, Idaho where I was a student at Idaho State University. There’s no denying that I drank more than my fair share of beer during that period, but in terms of both quality and variety those were lean years for beer. When I started college in 1984 there were no commercial breweries in the entire state of Idaho. The taps at most bars were dominated by different varieties of Budweiser and Coors, and that was the good stuff. Trips to the supermarket or convenience store often saw us returning with lower price options like Rainier, Olympia, Schaefer, Hamm’s, or Keystone Light, which for those of you old enough to remember ran what now seems like a laughable advertising campaign to brand itself America’s least bitter beer. Let’s just say those beers were (and still are) best served as cold as possible. To recreate the imported beer selection in Pocatello at that time all you need to do is head down to your local Mexican restaurant. I can say with a straight face that Henry Weinhard’s Private Reserve was probably the best beer you could buy in Pocatello in those days. Although at $1.50 per glass (50% more than a Bud or Coors) Henry’s was generally reserved for special occasions. Most of my relatives still live in Idaho, so I make regular pilgrimages back to the heart of potato country. The beer scene in Idaho has vastly improved since my undergrad days, but breweries in southeastern part of the state are still pretty sparse. 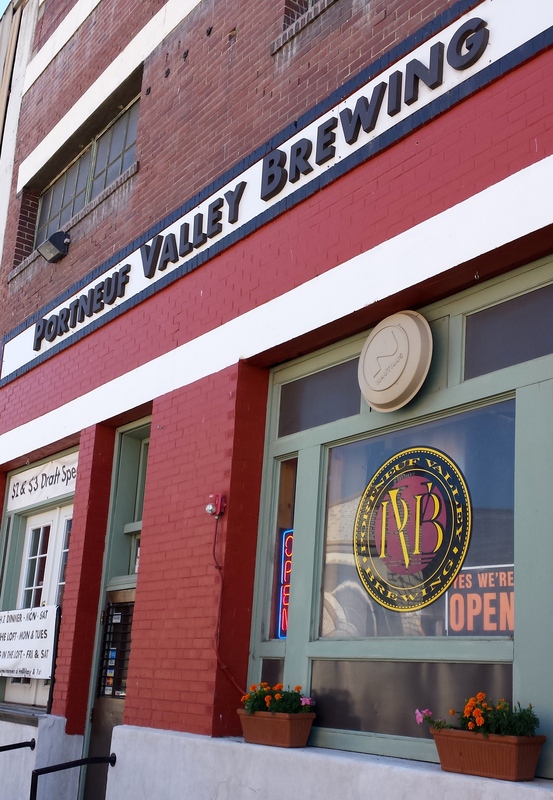 Pocatello is home to a total of one brewery, Portneuf Valley Brewing. Despite several unsuccessful attempts I had not previously managed to visit their brewpub, but I was able to correct that oversight on my most recent trip to Pocatello. A quick three day visit to attend the 50th Wedding Anniversary of my wife’s parents, Chet and Sheila. Portneuf Valley Brewing is housed in the old East Idaho Brewing Company building. Portneuf Valley Brewing (PVB for short) is owned and operated by Penny Pink, who was an analytical chemist at the Idaho National Laboratory before opening the brewery. If there is another brewery out there run by a female chemist, I’m willing to bet a large sum of money that she doesn’t have a name as cool as Penny Pink. My old friend George Asboe used to work for Penny at PVB, which I always thought was a pretty cool gig. Although PVB has been in operation since 1999, the brewpub has only been open since 2005. It’s located in an old red brick building sits between S. 1st street and the railroad tracks, in what I would call the (abandoned) warehouse district of Pocatello. The inside is a long narrow space divided into a front area that contains a small bar and seating for 20-30 people, and a back room that has even more seating and is laid out a bit like a restaurant. 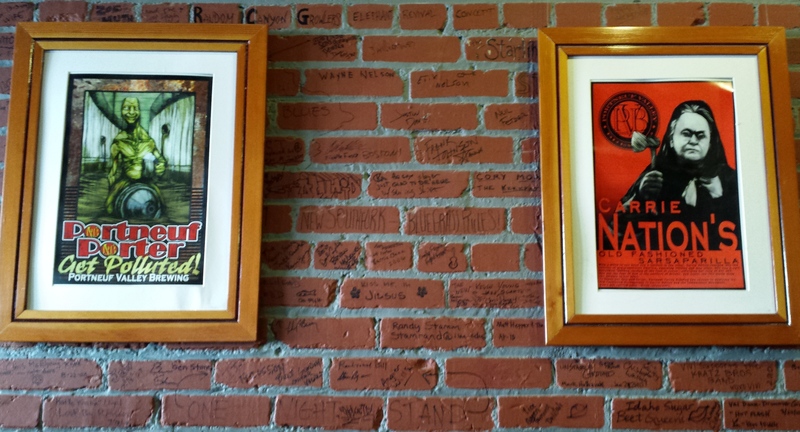 Framed posters of various PVB beers adorn the red brick wall on the left hand side of the brewpub, while windows on the right side give you a look at the stainless steel tanks where the beer is made. There are flyers announcing local bands that will be playing at PVB in the coming weeks, but on the night we visited there was no live music. It’s a casual atmosphere with a nice cozy vibe. I was only able to work this visit to the brewery into my schedule by convincing my wife and kids that it would be a good place to eat dinner. I had no firsthand knowledge this was actually true, but as it turns out the food there is quite good. The menu has a lot of variety, the servings are large, and the prices are reasonable. All three kids had pizza, which you could tell was made from scratch and very tasty (they each had to order their own pizza to make sure we did our part to support the local economy). Although she wouldn’t admit it, my wife is pretty picky when it comes to food and she really liked the chicken curry. I had the jambalaya, which was better than average with a nice spicy zip to it. In the end everyone seemed happy with their food. Suffice to say PVB is a great option if you are in Pocatello and looking for a good place to eat dinner or lunch. Be warned that it takes a while to get your food, but if you are in a position to enjoy a couple of beers and soak up the atmosphere that’s not a problem. 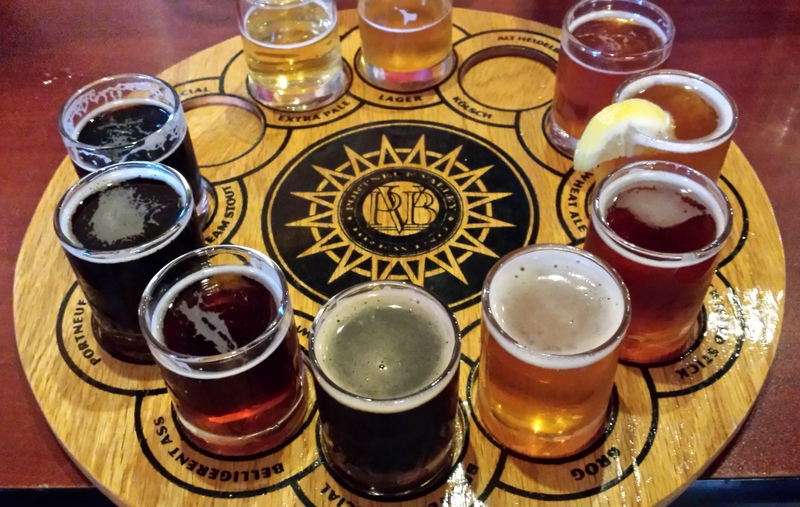 For a small brewery PVB offers a good selection of beers, eight year round beers and two seasonals. The taplist is surprisingly full of sessionable beers, even by English standards. Six of the eight year round taps have an abv less than 4%, and the strongest beer is only 6% abv. I guess they were into session beers before session beers were fashionable, or maybe Penny is just an anti-imperialist. For the tidy sum of $10 I ordered a sampler of all ten beers on tap. I’m not going to give you a blow by blow of each beer, but my overall review can be summed up in four words, “decent but not remarkable.” There were no off flavors or other unpleasant aspects to any of the beers, but unfortunately most of them just weren’t that interesting. At 3.1% abv and selling for $2 a pint the Penny’s Extra Pale is clearly meant for someone who knows their way around the walk-in beer cooler at the local gas station. The Krystal Weizen would be more appropriately labeled an American Wheat Ale. It is served with a lemon wedge (even in the sampler tray! ), and the clove and banana flavors you expect from a Kristalweizen/Hefeweizen are absent. One of the better beers is called Grog, which from the name I expected to be some kind of spiced ale, but is actually their IPA. At 5.2% abv and 60 IBU it stood out compared to most of the beers in the sampling tray. I felt the best beer was a seasonal, Shady Side Black IPA, which featured balanced contributions from both the roasted malts and the hops. I don’t know if the restrained flavor profiles are a result of adjusting the recipes to make beer that is accessible to people who might be unfamiliar or even averse to craft beer, or is a function of using smaller quantities of malt and hops to try and keep the production cost down. While I can see why a brewery in Pocatello would need to brew some easy drinking beers to appeal to a broad clientele, I don’t see why they can’t be more adventurous with some of the styles. Go ahead and keep the Ligertown Lager and Krystal Weizen easy drinking and sessionable, but why not up the flavors in the stout and IPA to make them a little more interesting. The sampler tray at PVB, 10 beers for $10. Rural states sometimes get a bad rap for lack of culture, but having spent my formative years in Idaho I think that is a little unfair. What other brewery can claim to be located within a block of something as interesting as the Museum of Clean. 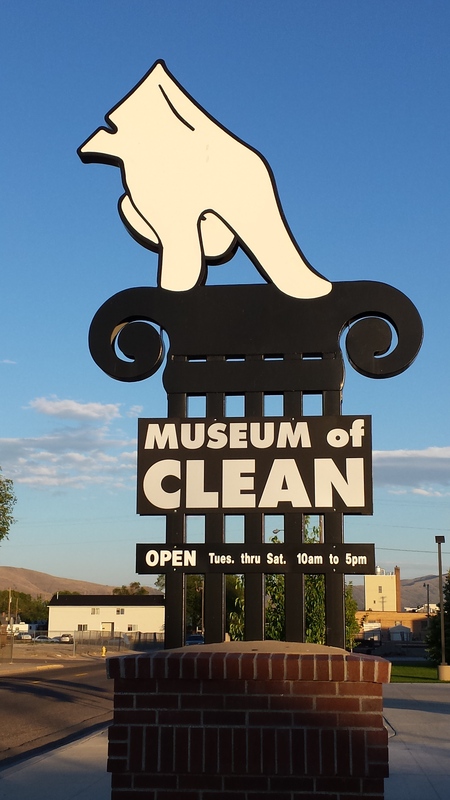 This newish addition to the Pocatello art and culture scene boasts the world’s largest collection of vacuum cleaning devices, a display on toilets that dates back to Queen Elizabeth (of Austria not England), and a huge trash can. If you time your visit properly you can work up a thirst at the Museum of Clean before heading over to PVB for a well-earned appetizer and pint of beer. Best to hit the nearby Museum of Clean before happy hour. Taking liberties with an old Frank Zappa quote, to be a real city you need a flag, some kind of football team, and a brewery. The good news for Pocatello is that they have all three, which is more than can be said for Burley, Soda Springs, Rigby or Rockland. The bad news is that the North American Vexillological Association named Pocatello’s flag the worst city flag in the entire US, and the ISU football team hasn’t had a winning football season since 2003. The situation is a little better when it comes to brewing, but Portneuf Valley Brewing needs to step out of its box a little. Maybe the city should take up a collection so that Penny can do a sabbatical at a brewery that has an attitude, like Stone or Rogue. Still given the lack of other local options I intend to visit PVB on a more regular basis when in Pocatello, but I’ll try to time my visits so that they coincide with either dinner time or happy hour. Who wouldn’t be proud to live in a city with a flag this classy?